May the Force be with you! Join the County of Orange and OC Parks for Star Wars Day at the OC Zoo on Saturday, June 17 from 10 a.m. to 3 p.m. Gather family and friends for a day of animals and activities at the OC Zoo. 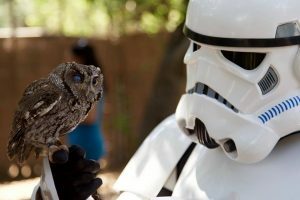 Star Wars Day at the OC Zoo invites Stars Wars fans of all ages to enjoy a fun filled day of activities including visits from Star Wars characters, kids’ crafts, games, and photo opportunities. Zoo animals will receive special treats and there will be animal meet and greets throughout the day. Visitors are encouraged to come dressed as their favorite Star Wars character, and the first 100 children (ages 12 & under) wearing a Star Wars costume will receive a special gift and free train ticket to ride the Irvine Park Railroad. Activities are complimentary with the purchase of a paid zoo ticket of $2 per person (ages 2 and under are free). Reservations for Star Wars Day are not required and parking is $5 per vehicle.